Removable Partial Dentures explained by dentist at Ballarat Dental Care: Removable Partial Dentures used to be a common dental procedure and is still used on many dental patients as an interim solution by their dentist, until a definitive treatment plan is decided. Partial dentures that are removable replace one or more missing teeth, they are usually held on by other teeth and the gums. 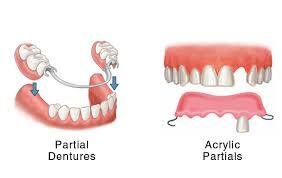 Removable partial dentures usually have a small base and are held on with wire clasps on the teeth. Removable partial dentures with dentist Ballarat can be made from acrylic, chrome cobalt which is metal and valplast which is a flexible plastic. Denture made out of plastic is usually cost effective and more teeth can be added if more is lost. Denture can be repaired for any breakages when they occur. The metal or chrome cobalt denture is a more comfortable solution, which is not bulky and is of minimal size, but more teeth cannot be added to the denture. Denture making is relatively straight forward which would involve one to three appointments depending on the patient. If you need any dentures done at Ballarat, please call our Ballarat Dental Care to book your denture consultation and speak to our qualified dentists at our dental clinic doing dentures in Ballarat.